Activate your widget areas, attach them to your menu items, and add widgets to the areas in the normal fashion. Adding content via widgets is easy, but takes several steps. The basic process is to (1) Create a Menu Item (2) Set the Menu Item’s Widget Area (3) Populate the Widget Area with Widgets. You should think of a single menu item, which contains a single Widget Area, as a full-width row in the submenu of the menu. Multiple widgets in a single widget area automatically create columns within that row. Set the number of Widget Areas you are going to use via the Control Panel Appearance > UberMenu > Descriptions, Shortcodes, Widgets > Number of Widget Areas. It must be set to at least 1 to use widgets. Save the UberMenu options with your new Number of Widget Areas. Note that you may use shortcodes within text widgets. 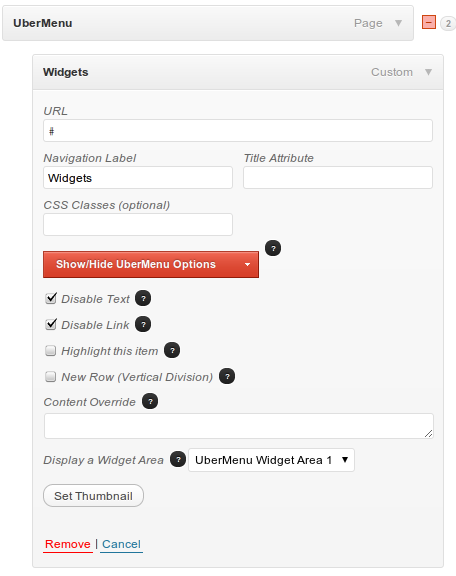 By default your widget areas will be named sequentially as “UberMenu Widget Area #”. If you want to tag them with something more memorable, provide your desired names in the control panel. They will be applied in order.